An evolution has occurred in the online North Carolina School Report Cards database that makes it easier for users to understand how a school has performed in growth and achievement on standardized tests. State Superintendent Mark Johnson unveiled the revamped website this week which is built and maintained by Cary-based SAS Institute, Inc. The new website is very visual and displays data using bar charts that are colorful and easy to read. All public schools – district and charter – are included and finding schools is easy thanks to a large interactive map and easy-to-read drop-down menus. WakeEd has advocated in the past for a comprehensive school performance report, and this is a welcome improvement over the previous version. Wake County Public Schools produces its annual “school progress reports” in PDF form for each school. They show data in relative terms and eschew the use of letter grades. The new state report cards have moved closer to the Wake report cards model. The state’s update to its school report cards places less emphasis on the A-F scale adopted starting with the 2014-15 school year. The A-F grades have received mixed reviews because public school advocates say the lower grades will unfairly stigmatize schools, while proponents argue that progress indicators need to be easy for the average public to understand. Each school’s performance page still shows the A-F status, but the grade is given a similar weight to other measures such as growth and composite test scores. The only color-coded indicator is for growth to show if the school “did not meet,” “met,” or “exceeded” growth. The colors, thankfully, avoid the stoplight palette of red, yellow, and green. Instead, schools that didn’t meet growth are colored gray, while schools that exceed growth are a yellow-orange color. Growth, school advocates say, is a better indicator of a school’s effectiveness because it recognizes student progress. This progress may show that students actually learned more than a year’s worth of material in one school year. This concept is equally true for academically gifted as it is for academically challenged students. Achievement data – the headcount of students who passed state tests – is broken down by subject and again by achievement level of 1-5, with 5 being the highest. This information is compared with the district-wide and statewide performance information, so users can easily see how the school compares to larger groups. Achievement is seen by many as important because it demonstrates mastery of that grade level’s content. 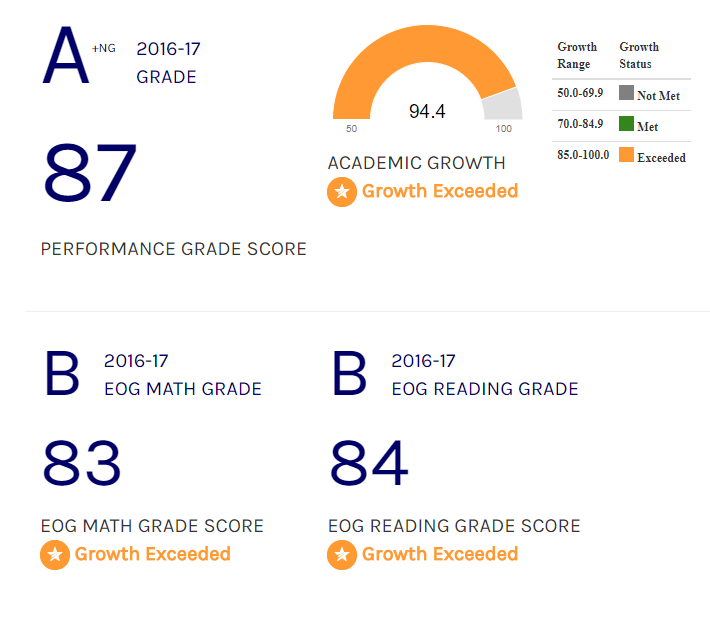 In addition to growth and achievement performance on state standardized tests, the report cards also show relevant data about the school that isn’t calculated as part of the letter grade. These include how many teachers are certified to teach in their assigned area, hold an advanced degree, and are National Board-certified. There’s also information about student discipline, attendance library books, digital device-to-student ratios, and classroom wireless internet availability. These can be useful metrics for parents and others who want a snapshot of a school’s overall ability to be successful. School report cards are not unique to North Carolina. In fact, almost all states produce some kind of annual performance report for their public schools. Now with the requirements in the federal Every Student Succeeds Act that every state prepare school accountability plans, reports cards are likely to be around for a long time. The next step is to make sure report cards meet two standards. Their scores must be based on equitable formulas and they must provide relevant data. North Carolina’s new report cards represent a move towards ease of understanding relevant data, but there’s concern among school advocates that the formula used to calculate the A-F grades needs improvement. The state uses two factors to calculate the scores, and then sets the letter grades based on those scores. To get the score, the number of students who pass the test are counted, and then the number of students who met their expected growth targets are counted. The two scores are then weighted with 80 percent going towards passing and 20 percent going towards growth. It would be better to weight these two measures equally. The second part of the grading formula involves the points span between the letter grades. There’s a 15-point spread between the A-F grades, so 100-85 is an A, 84-70 is a B, and so on. Next year, state law will require a shift to a 10-point scale. This means that many schools might produce the same or even a higher numerical score, but may end up with a lower letter grade. Since D and F schools are considered low performing schools, there’s a large number of schools which will suddenly be labeled as deficient. While the report cards themselves don’t make any indication that a school is low-performing, it is an important distinction for schools which are making improvements. Since users have the ability to look at report card data from prior school years, the change in grade may create confusion and give the incorrect appearance that a school is failing when it actually improved. Therefore, it would be better to stay with the 15-point scale. Fixing these items will take legislative action and they have an opportunity in 2018 to remove the final hurdles to creating a school performance reporting system that is easy for non-educators to understand, provides relevant data, and presents a useful snapshot of the overall health and effectiveness of individual schools.